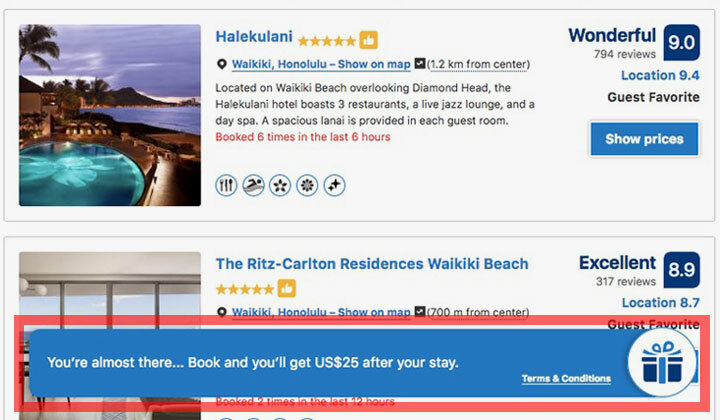 In this post you’ll find the working Booking.com refer a friend invite link for a $25 cash reward for all hotel bookings in 2019, valid for new & old accounts. Click below Booking.com referral link to activate cash reward! With this Booking.com promotion, get up to $25 off from one hotel booking as a cashback, verified working in April of 2019. Enjoy! Please note. Incase the invite doesn’t work for some reason, please leave a comment below, and I will provide a working refer a friend link for you. This is how the invite bonus offer works to collect your free $25 cash reward. Each link can be used only 10 times, once per account (no codes exist), which is why most links circulating online are used up and no longer working. This post however, is regularly updated with working links. You can be logged in with an old account, or register a new one. Either way works! Step 2. You’ll see the available cash reward offer, click on “Let’s do this”. Note! The available cash back amount can differ depending on the refer a friend link used. Either way the rewards are similar, ranging from $15 to $25 in USD or other currencies, and some might offer a 10% reward from the booking made. Step 3. You’ll see a message saying “You’re almost there… Book and you’ll get US$25 after your stay”. Proceed to make your hotel booking as usual. Step 4. That’s it. After you have stayed at the booked hotel successfully, the cash reward will be automatically deposited to your credit card on file. Note! 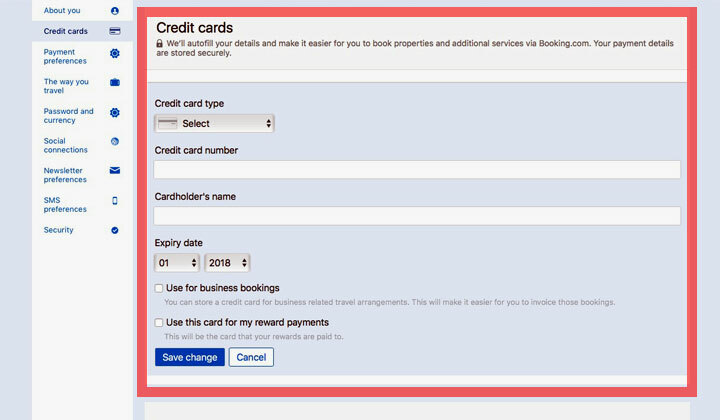 Make sure to add your credit card through Booking.com settings, this can be either a credit or debit card. Nearly all cards are supported. Some customers have thought that they can use the link several times for obtaining the reward. This is not true. Only one booking per account! 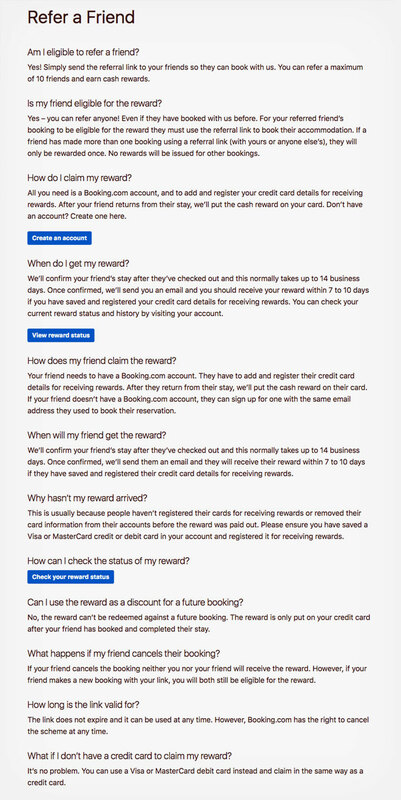 You cannot register false Booking.com accounts to make refer a friend links, both accounts, invite and invitee need to be verified by credit card. Accepted cards include debit and credit cards from American Express, Visa, Euro/Mastercard & MasterCard (virtual credit card). There are no coupon codes, or discount codes, the promotion is only activated by clicking on a valid referral link. Facing problems? See the bottom of this article for the FAQ. Each Booking.com user with a verified credit card on file has their own unique referral link that you can spread the offer with, amongst friends or pretty much anyone, for up to a $250 total cash reward for yourself. In the top menu, see link that says “Refer friends and earn”. You have the option to copy your link and use it where ever you wish. There is also a button for sharing the link on social media, email, etc. Also you’ll see live statistics of active referrals on this page. The refer a friend link can only be used 10 times in total, by 10 different Booking.com account holders. You can receive the cash reward only after the friend has paid for, and ended their stay at the hotel. The cash reward is different depending on the country where you registered your Booking.com account. More details below! This is what it looks like if you use the button to share your link on Twitter. The offer is different depending on country location. So the currency can differ, and the amount money offered for both parties. So for example, account holders in Canada will receive the reward in Canadian dollars. Or those from the UK will get the reward in Pound sterling and offer a 10% cashback for those referred, instead of a fixed amount. Some country locations will offer a better deal than others, however once it’s set you can no longer change it. The first country location you have used to register your account will be applied. The only way to change country is to register a new account. Note that country location is determined by your IP address. This is the number assigned to each internet connection to define your location. Besides moving to that location, the only other way is to use a VPN connection to route your internet connection through a country like US for example. Here is a detailed list of available cash rewards! One of the best offers is for those who are located in the United States, you can get $25 US dollars for every friend you invite to Booking.com, and if your friend books and stays at a hotel, they get the same $25 deposited to their credit card. Also account holders from the United Kingdom have a very attractive offer, with it you can get £20 for each invited friend and your friend can get 10% off from a single hotel booking on the Booking.com website, in the form of a cashback. 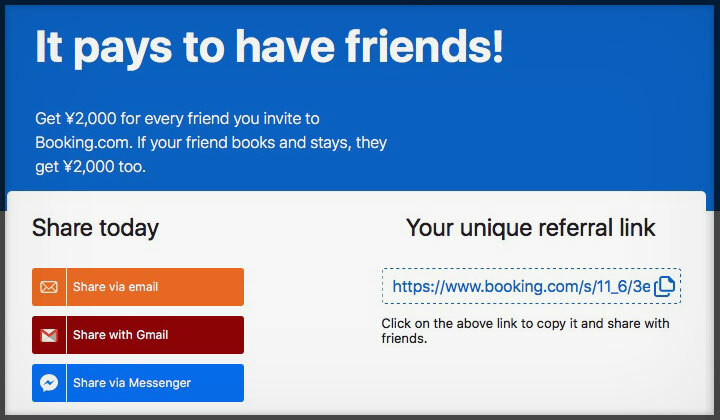 Get CAD 25 (Canadian Dollars) for every friend you invite, and if your friend stays at a hotel through Booking.com, they get the same CAD 25. For Booking.com accounts from all European countries, you get €20 for each referral and if your friend books and stays, they get 10% back. Belgium, Bulgaria, Croatia, Cyprus, Denmark, Germany, Estonia, Finland, France, Greece, United Kingdom (UK), Hungary, Ireland, Italy, Latvia, Lithuania, Luxembourg, Malta, The Netherlands (Holland), Austria, Poland, Portugal, Romania, Slovenia, Slovakia, Spain, Czech Republic, Sweden. Albania, Armenia. Belarus, Gibraltar, Iceland, Kosovo, Lechtenstein, Macedonia, Norway, Russian Federation, Switzerland, Turkey, Ukraine. 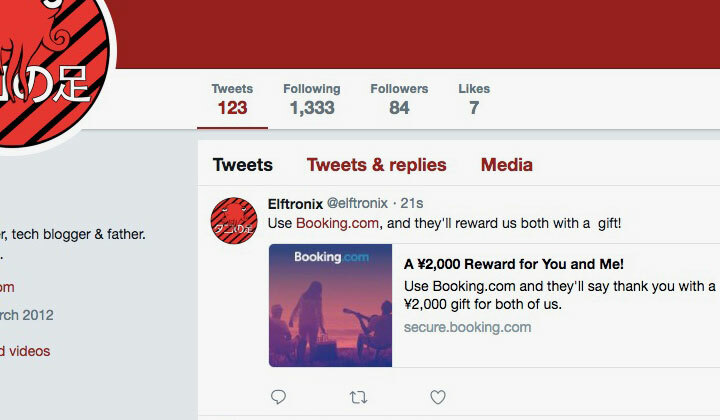 Booking.com account holders located in Japan, will get the reward in Japanese YEN, total ¥2000 for both the invite and person invited. In Thailand, the cash reward is THB 550 (Thai baht) for both. In Australia, AUD 25 (Australian Dollars) for both. In India, Rs. 700 (Indian rupee) for both. In Brazil, R$ 50 (Brazilian real) for both. 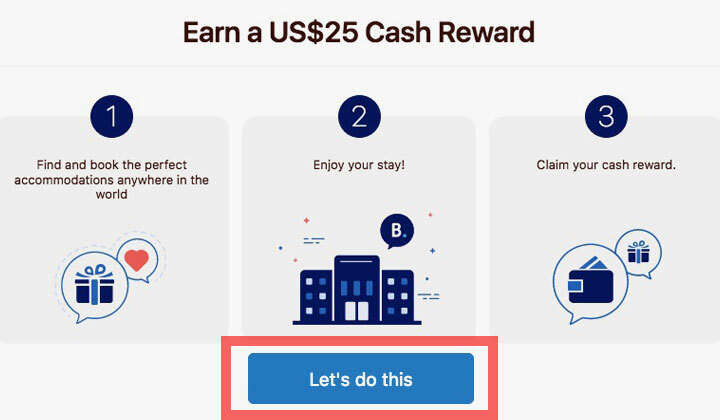 For users of Booking.com in most South American countries (excluding Brazil) the cash reward offer is in US Dollars, total $15 for both. Belize, Costa Rica, El Salvador, Guatemala, Honduras, Mexico, Nicaragua, Panama, Argentina, Bolivia, Brazil, Chile, Colombia, Ecuador, French Guiana, Guyana, Paraguay, Peru, Suriname, Uruguay, Venezuela, Cuba, Dominican Republic, Haiti. Other country locations are offered $15 in US Dollars for every friend that’s invited to Booking.com, and those friends get 10% back of their hotel booking. Russia, Hong Kong, Malaysia, South Korea, New Zealand, Singapore, Turkey, Egypt, Israel, Kazakhstan. Macau, United Arab Emirates, Saudi Arabia, Lebanon, Qatar, Mainland China. Is the referral program not working for you? If you have any issues with the cash reward, your unique refer a friend link, etc. Please check the FAQ below. If you still have problems, leave a comment and I’ll do my best to help out. Please note, that the refer a friend link above might not work in case it’s used up. Rest assured, I will fix the link as soon as possible. 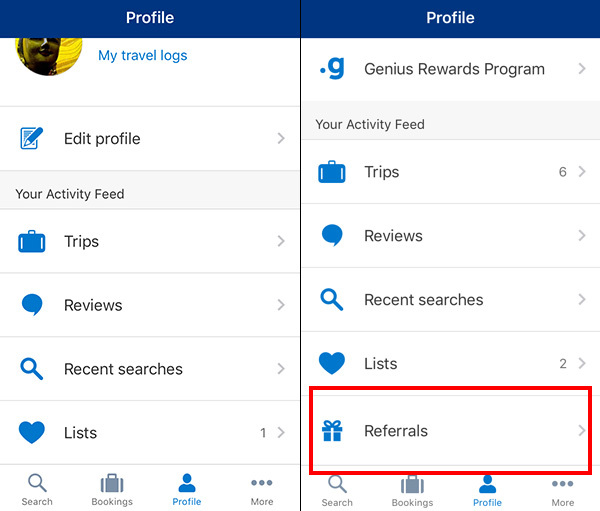 For any questions about Booking.com referral program, cash rewards, bonuses, discounts and coupon codes. Please, just leave that comment! Hi, is referal program disabled right now? I tried to register new account but can’t see this program anymore. Tried with few new accounts but with same result. Still working here, so it shouldn’t be disabled. You can always try to clear your cookies (preferably before creating new accounts), another browser or even a VPN. If anyone needs a link for another country, just let me know. Alright. I’ll get to the bottom of this and get back to you later. Hi there. Accounts from Australia can use the US or UK link. Shouldn’t make a difference. Probably the USA one is the main one for English. No individual link for Australia exists. I need a link for Canada please. I’m suspecting that they have disabled the refer a friend program for newly created booking.com accounts. But haven’t been able to get any statement from them, yet. Their support team is completely incompetent, having exchanged 18 emails so far, they have still not been able to answer a simple question.. Some updates as Booking.com has finally answered that the “RAF” link should be present but there might be some testing that can interrupt the system. This might be a part of testing that we often do to improve our service. Please use different device (smart phone, computer, App). Well, I have now tested the iOS Booking.com App with an old account, and a new account. And still the “referrals” menu item is missing from latter. This is a screenshot from the App comparing both accounts. For now it seems that the official word from Booking.com is that if the system detects that you are using a device that was previously used with another account (browser history, cookies, IP address, etc), the referrals option will not show up. Please try deleting your browser history and cookies and try logging in again. If you are trying to get the link from the same devices as your old account there is a possibility that our system still links the IP addresses to your old account. Or it just doesn’t work anymore. I’ve the same problem I’ve tried deleting cookies, history and diferent IP. Now appears an afiliate program link https://www.booking.com/affiliate-program/v2/index.html Do you know how this works? This is their affiliate program, you get a 25% commission per referral (not from total booking but from the commission that Booking.com is getting). In the “Affiliate Partner Centre”, you can generate custom affiliate links that will redirect visitors to a page of your choice. And there is no incentive or other benefit for the person using the link before they book a hotel. And so also how much you can make will likely be less per referral than with the “refer a friend” program. However, there is no limit to how many referrals you can make, which is better for those with lots of leads. Do you know if the friend programm is still working for real new accounts?? At the moment it’s not working for new accounts. Is the link above used more than 10 times? Can I book using the above link and later be notified by booking that I am not eligible for the discount since the link was used for more than 10 times? First of all, it has not been used 10 times yet. And once the link is outdated, I will replace it with a new working link for the current month of 2018, 2019, etc. If it gives you the offer, and you register a new account after clicking on it on a browser that has cleared cookies after using old accounts, it should work. So if the booking goes through with the discount, then you’re fine. And thanks for asking Igor, please, let me know if you need any further details. Is there any way to get my own referral link nowadays? Sorry. At the moment it seems they are not giving out reward links to new users. But at any time you can check out the “Booking.com rewards hub” for new opportunities. Or an alternative is to try this link for an overview of available rewards. Will referral show up if I make a reservation and complete it? Or complete 2 reservation to be a genius member for newly created accounts. Did anybody try it ? I tried with only one reservation (completed) – nothing happend. Please, let us know if you make a second booking. I never received my referral link, I joined Booking. com in 2015. Thank you. I think you would have needed to join the ‘refer friends and earn’ program when it was available. Maybe next time! Sorry, as far as I know it won’t work. Is there any way to get my own referral link nowadays? There must be because there are many new links in blogs and forums. Hello, any news about ht “Refer a Friend” link?